156 Pages. A single copy of the Winter 2013 issue of the PWC Newsletter featuring the 2013 National Specialty, including 120 pages of color specialty coverage and ads. Chronological color coverage of the National Specialty, Main Street USA, includes an overview of the week-long event by Show Chair Brenda Stiles. Informative articles covering the Performance events follow, with Cindy Traylor covering the Herding Trials, Mary Samuel covering the Tracking Tests, Vicki Sandage, DVM on Agility, Pati Wiedel on Obedience and Walter OBrien reporting on Rally. National Coverage includes many photo collages of all the events, as well as reports on the Corgi-O-Kee Welcome Party, the special Wednesday night Made In America Sweepstakes, the banquet, and the Triathlon Competition. Critiques and collages are provided for Puppy and Veteran Sweepstakes, Regular and Non-Regular Classes and Junior Showmanship. A course analysis by agility judge Deb Auer and a report on the Peer Education seminar given by Dr. Dan Griffiths rounds out the specialty coverage. 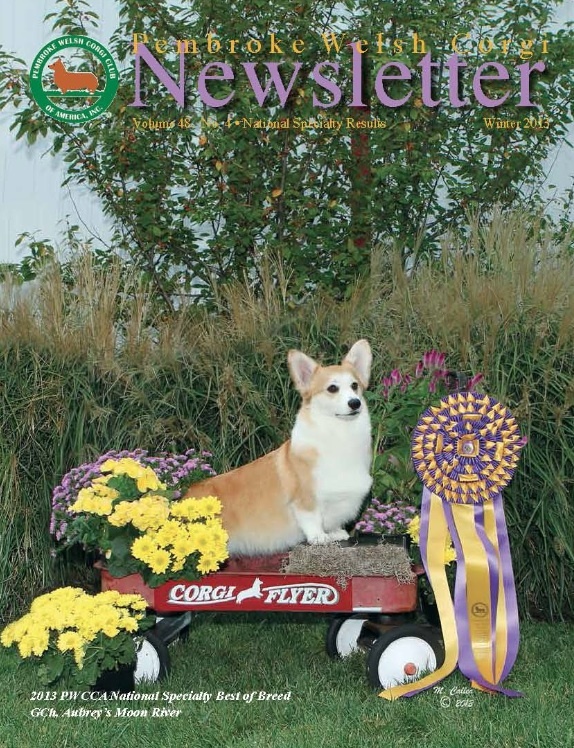 The Regional Talebearers reports include a Spotlight on the Ohio Valley Pembroke Welsh Corgi Club with pictures. Calendar of Events, PWCCA Business information, Regular Editors Columns and color and b/w ads featuring PWCs. Available only as long as supplies last. Please choose "Domestic" or "Foreign" shipping in the Price Options dropdown menu.